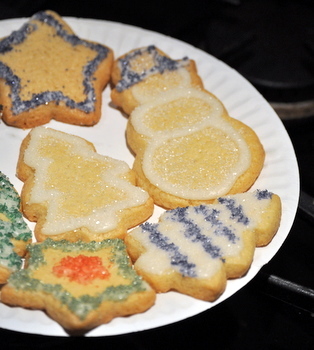 Homemade baked goods are one of the best gifts that you can give during the holiday season. They’re good any time of year, of course, but the holiday spirit seems to make people enjoy baked goods even more than usual! Baked goods, even some as simple as chocolate chip cookies made with the back-of-the-bag recipe (which is generally a good one, incidentally), are tasty, relatively inexpensive and convey a lot of effort and good feelings. It is easy to give homemade treats to neighbors, coworkers and friends who live nearby because you can wrap up a plate and hand it over. Shipping goodies takes a little more thought, so here are some tips to help your holiday shipping go smoothly. There are all kinds of great homemade goodies that you can ship and the options are almost limitless, with so many shipping options at our disposal. Generally, however, you want to choose baked goods that are relatively sturdy and will keep well, so that they arrive as good looking and fresh tasting as they left. Gingerbread Cookies ship very well and remain soft and chewy even after a few days. Orange and Clove Snowballs keep their tender texture and have lots of holiday flavor. Most drop cookies are good choices because they can handle the rigeurs of shipping with ease. Brownies and fudge ship well. Biscotti ship extremely well, too. Homemade chocolates, marshmallows and candied nuts are also great options, and you can find more suggestions here. 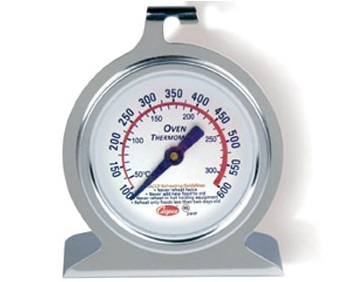 Pack your baked goods as soon as they have completely cooled so that they are at their freshest. Pack them in airtight container or in ziploc bags to seal in freshness and prevent your treats from going stale. Layer your treats with pieces of wax paper or parchment paper to keep them separated. Inexpensive, reusable plastic containers are great for shipping and your recipient can use the empty containers in their own kitchen. If you seal up treats in a plastic bag, place the bag inside a gift tin or other hard-sided box so that the treats are protected during shipping. Use piece of wax paper, parchment paper or even paper towels to fill in any gaps between your treats and the sides of your container, so that nothing moves around during transit. Place your carefully packed treat box inside of a larger mailing box and fill in the space around your treat box with crumpled news paper, bubble wrap or some other filler, again to prevent the contents of the box from moving around to provide some cushioning. Whether you choose to ship your package via USPS, Fed Ex or UPS, it is usually best to choose an express or priority shipping method that will get your package there in 2-3 days. 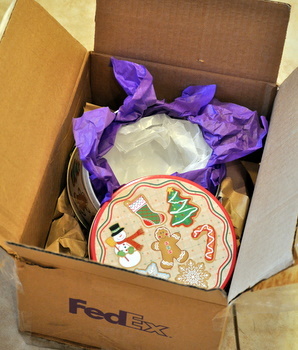 This way,your carefully packed cookies or other goodies will arrive as fresh and tasty as possible. If you choose regular shipping, try to select treats that will keep for a longer period of time in case shipping takes a few extra days. Rum balls, fruitcake and chocolates or candies are good examples here. If you decide to ship something very perishable, choose overnight or one-day shipping and consider using a thick styrofoam container to provide insulation to your goodies, in addition to providing structural support to your box. Finally, add some insurance to your package in the form of non-edible goodies to give your gift recipients something to enjoy with your treats or, if something goes awry during shipping, instead of them. Recipe cards, including the recipe for the included goodies are a great idea. Small kitchen accessories, like spatulas and whisks are always well received, too. Oh I wish I could have seen this a few days ago, I sent a package of baked goods across the country and have never done it before, I hope everything gets there alright. This is a great guide, I will use it next year. Thanks for sharing this info on shipping baked goods, this was most helpful! I find this post very useful for me as I have to ship no. of packets this week. I am sure this will work for me in a better way what I thought previously. what great tips! they are very informative and helpful! Thanks so much!